A ZIMBABWEAN truck driver is battling for life at a hospital in Durban, KwaZulu Natal province in South Africa after he was caught up in suspected fresh xenophobic attacks in the neighbouring country. More than 100 foreigners, among them Zimbabweans, were forced to flee their homes and seek refuge at Sydenham Police Station. Zimbabwe’s Consul General to South Africa, Mr Batiraishe Mukonoweshuro yesterday confirmed that the truck driver, Mr Tineyi Takawira, was admitted to King Edward Hospital after he was stabbed during an attack. “I can confirm that Tineyi Takawira, a Zimbabwean truck driver is admitted to King Edward Hospital in Durban after he was attacked by protesters in Durban’s Springfield Park informal settlement.The protesters barricaded roads and intercepted truck drivers demanding to see their identity documents and those found to be foreigners were attacked,” he said. Mr Mukonoweshuro said a Zimbabwean woman married to a Malawian truck driver was among the people who fled to the police station after she was attacked and badly injured. He said they were yet to ascertain the exact number of Zimbabweans who were attacked and were working with police and relevant authorities in the neighbouring country. “We believe that there could be a substantial number of our people who were injured during the attacks but we are yet to ascertain the figures. Police have assured us that the situation has calmed down but we will continue to monitor the situation,” said Mr Mukonoweshuro. 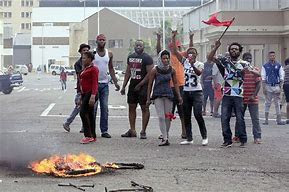 The first wave of violence broke out in the Kenville area, north of Durban on Sunday at about 11PM when mobs of protesters burst into the homes of foreigners grabbing property that included beds ,TV sets, pots and baskets before targeting foreign-operated shops. The protesters, numbering about 100, blocked Sea Cow Lake and Inanda roads using rubble from burnt tyres. The attacks left three people dead and they are all South Africans. Two of the victims were shot by a foreign tuckshop owner who opened fire on the mob that was looting his shop. The attacks on foreigners flared up in Durban between Sunday night and early Tuesday, forcing over a 100 foreigners to flee their homes and seek refuge at a police station. KwaZulu Natal provincial police spokesperson Colonel Thulani Zwane yesterday confirmed that more foreign nationals sought shelter at Sydenham Police Station on Tuesday night. “About 70 foreign nationals went to Sydenham Police Station for help on Tuesday night but no serious injuries were reported,” he said. According to South African media reports, unemployed informal settlement residents are angry because foreign nationals are employed by local companies. The Durban attacks come barely three days after the South African government launched a national action plan to combat racism, racial discrimination, xenophobia and ethnic intolerance . The attacks targeted at foreign shop owners began on Sunday night at Kenville residential area in northern Durban. Residents woke up to screams and chants as a mob of people walked through the area overturning refuse bins, cutting down tree branches, burning tyres, looting shops and stoning cars and homes. A video is also circulating on social media showing foreigners being attacked and one man is heard speaking in Zulu, saying foreigners are working and the locals are not working. On Monday, South Africa launched a national action plan to combat racism, racial discrimination, xenophobia and ethnic intolerance. It was launched by the Justice and Constitutional Development Deputy Minister John Jeffery at the St George Hotel in Irene and the event was attended by civil society organisations and government officials among others.